JANSSONIUS -Capitaniarum de Phernambuca, Itama Raca, Paraiba, et Pio Grande Nova Delineatio. JANSSONIUS, J. - Capitaniarum de Phernambuca, Itama Raca, Paraiba, et Pio Grande Nova Delineatio. Capitaniarum de Phernambuca, Itama Raca, Paraiba, et Pio Grande Nova Delineatio. - JANSSONIUS, J. Title : Capitaniarum de Phernambuca, Itama Raca, Paraiba, et Pio Grande Nova Delineatio.. Size : 17.6 x 21.9 inches. / 44.7 x 55.5 cm. 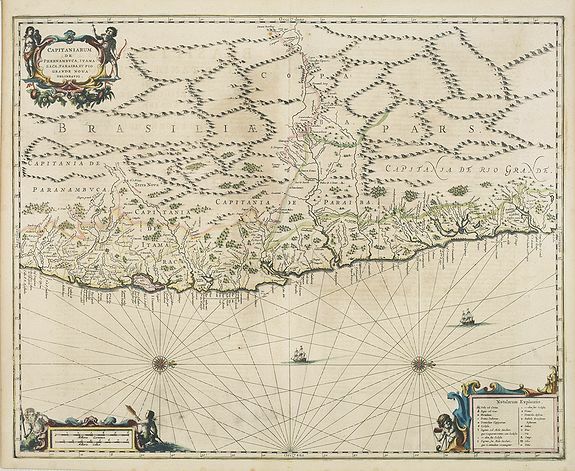 Description :Rare map of part of the coast of Brazil. From Janssonius' 'Atlas Novus'. Rare. Title in cartouche at upper left, scale bars in frame at lower left, and legend in frame at lower right. Also with a compass rose at bottom left and at bottom right. Orientated on the west. Extending north to south from the Rio Araguaia to Cabo de Santo Agostinho, Brazil. Scale: ca. 1:500.000. Much information is derived from maps drawn for the Dutch West Indian Company. Published by the famous Amsterdam publisher Johannes Janssonius (Arnhem 1588-Amsterdam 1664). In 1612 Janssonius married Elisabeth Hondius, sister of Henricus Hondius. In 1630 he associated with his brother-in-law with whom he co-operated till his death in 1651. Decorated with 2 symmetrical compass roses, title, scale- and legend cartouche and 2 vessels. Condition : In very attractive original colours. Some browning of the paper. Short left/right margins, as issued.